Buddhism in Thailand is largely of the Theravada school. As much as 94% of Thailand’s population is Buddhist of the Theravada school, though Buddhism in this country has become integrated with folk beliefs such as ancestor worship as well as Chinese religions from the large Thai-Chinese population. Buddhist temples in Thailand are characterized by tall golden stupas, and the Buddhist architecture of Thailand is influenced heavily by the architecture of other Southeast Asian countries, particularly Cambodia and Laos, with which Thailand shares cultural and historical heritage. Three major forces have influenced the development of Buddhism in Thailand. The most visible influence is that of the Theravada school of Buddhism, imported from Sri Lanka. While there are significant local and regional variations, the Theravada school provides most of the major themes of Thai Buddhism. By tradition, Pāli is the language of religion in Thailand. Scriptures are recorded in Pāli, using either the modern Thai script or the older Khom and Tham scripts. Pāli is also used in religious liturgy, despite the fact that most Thais understand very little of this ancient language. The Pāli Tipitaka is the primary religious text of Thailand, though many local texts have been composed in order to summerise the vast number of teachings found in the Tipitaka. The monastic code (Patimokkha) followed by Thai monks is taken from the Pāli Theravada- something that has provided a point of controversy during recent attempts to resurrect the bhikkhuni linneage in Thailand. The second major influence on Thai Buddhism were Brahmanist beliefs received from Cambodia, particularly during the Sukhothai period. Vedic Brahmanism played a strong rule in the early Thai institution of kingship, just as it did in Cambodia, and exerted influence in the creation of laws and order for Thai society as well as Thai religion. Certain rituals practiced in modern Thailand, either by monks or by Brahmanist ritual specialists, are either explicitly identified as Brahmanist in origin, or are easily seen to be derived from Brahmanist practices. While the visibility of Brahmanism in Thai society has been diminished substantially during the Chakri dynasty, Brahmanist influences- particularly shrines to the god Brahma- continue to be seen in and around Buddhist institutions and ceremonies. Folk religion- attempts to propitiate and attract the favor of local spirits known as phi forms the third major influence on Thai Buddhism. While Western observers (as well as urbane and Western educated Thais) have often drawn a clear line between Thai Buddhism and folk religious practices, this distinction is rarely observed in more rural locales. Spiritual power derived from the observance of Buddhist precepts and rituals is employed in attempting to appease local nature spirits. Many restrictions observed by rural Buddhist monks are derived not from the orthodox Vinaya, but from taboos derived from the practice of folk magic. Astrology, numerology, and the creation of talismans and charms also play a prominent role in Buddhism as practiced by the average Thai- topics that are, if not proscribed, at least marginalized in Buddhist texts. Additional, more minor influences can be observed stemming from contact with Mahayana Buddhism. Early Buddhism in Thailand is thought to have been derived from an unknown Mahayana tradition. While Mahayana Buddhism was gradually eclipsed in Thailand, certain features of Thai Buddhism- such as the appearance of the bodhisattva Lokesvara in some Thai religious architecture, and the belief that the king of Thailand is a bodhisattva himself- reveal the influence of Mahayna concepts. The only other bodhisattva prominent in Thai religion is Maitreya; Thais sometimes pray to be reborn during the time of Maitreya, or dedicate merit from worship activities to that end. In modern times, additional Mahayana influence has stemmed from the presence of Chinese immigrants in Thai society. While some Chinese have ‘converted’ to Thai-style Theravada Buddhism, many others maintain their own separate temples in the East Asian Mahayana tradition. The growing popularity of the goddess Kuan Yin in Thailand (a form of Avalokitesvara) may be attributable to the Chinese Mahayanist presence in Thailand. Like in most other Theravada nations, Buddhism in Thailand is represented primarily by the presence of Buddhist monks, who serve as officiants on ceremonial occasions, as well as being responsible for preserving and conveying the teachings of the Buddha. Up until the latter half of the 20th century, most monks in Thailand began their careers by serving as dek wat (litteraly ‘temple kid’). Dek wat are traditionally no younger than eight, and do minor housework around the temple. The primary reason for becoming a dek wat is to gain a basic education, particularly in basic reading and writing and the memorization of the scriptures chanted on ritual occasions. Prior to the creation of state-run primary schools in Thailand, village temples served as the primary form of education for most Thai boys. Service in a temple as a dek wat was a necessary prerequisite for attaining any higher education, and was the only learning available to most Thai peasants. Since the creation of a government-run educational apparatus in Thailand, the number of children living as dek wat has declined significantly. However, many government-run schools continue to operate on the premise of the local village temple. After serving (typically for four years or more) as a dek wat, a future monk typically ordains as a novice (samana in Pāli, or nain in Thai). 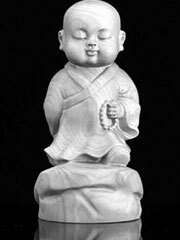 Novices live according to the Ten Precepts, as do monks, but are not formally required to follow the full range of monastic rules found in the Pattimokha (Buddhist monastic code). There are a few other significant differences between novices and monks. Novices often are in closer contact with their families, spending more time in the homes of their parents than monks. Novices do not participate in the recitation of the monastic code (and the confessions of violations) that take place on the uposatha days. Novices technically do not eat with the monks in their temple, but this typically only amounts to a gap in seating, rather than the separation observed between monks and the laity. Young men typically do not live as a novice for longer than one or two years. At the age of 20, they become eligible to receive upasampada, the higher ordination that establishes them as a full bhikkhu. A novice is technically sponsored by his parents in his ordination, but in practice in rural villages the entire village participates by providing the robes, begging bowl, and other requisites that will be required by the monk in his monastic life. Temporary ordination is the norm among Thai Buddhists. Most young men traditionally ordain for the term of a single rainy season (known in Pāli as vassa, and in Thai as phansa). Those who remain monks beyond their first vassa typically remain monks for between one and three years, officiating at religious ceremonies in surrounding villages and possibly receiving further education in reading and writing (possibly including the Kham or Tham scripts traditionally used in recording religious texts). After this period of one to three years, most young monks return to lay life, going on to marry and begin a family. Young men in Thailand who have undergone ordination are seen as being more suitable partners for marriage; unordained men are euphamistacally called ‘raw’, while those who have been ordained are said to be ‘cooked’. A period as a monk is a prerequisite for many positions of leadership within the village hierarchy. Most village elders or headmen were once monks, as were most traditional doctors, spirit priests, and some astrologists and fortune tellers. Monks who do not return to lay life typically specialize in either scholarship or meditation. Those who specialize in scholarship typically travel to regional education centers to begin further instruction in the Pāli language and the scriptures, and may then continue on to the major monastic universities located in Bangkok. The route of scholarship is also taken by monks who desire to rise in the ecclesiastic hierarchy, as promotions within the government-run system is contingent on passing examinations in Pāli and Buddhist philosophy. Monks who specialize in meditation typically seek out a known master in the meditation tradition, under whom they will study for a period of years. ‘Meditation monks’ are particularly revered in Thai society as possessing great virtue and as potential sources of supranatural powers. Ironically, monks of the Thai Forest Tradition often find themselves struggling to find time and privacy to meditate in the face of enthusiastic supporters seeking their blessings and attention. Unlike Burma and Sri Lanka, the female Theravada bhikkhuni lineage was never established in Thailand. As a result, there is a wide-spread perception among Thais that women are not meant to play an active role in monastic life; instead, they are expected to live as lay followers, making merit in the hopes of being born in a different role in their next life. As a result, lay women primarily participate in religious life either as lay participants in collective merit-making rituals, or by doing domestic work around temples. A small number of women choose to become Mae Ji, non-ordained religious specialists who permanently observe either the eight or ten precepts. Mae Ji do not generally receive the level of support given to ordained monks, and their position in Thai society is the subject of some discussion. Recently, there have been efforts to attempt to introduce a bhikkhuni lineage in Sri Lanka as a step towards improving the position of women in Thai Buddhism. Unlike similar efforts in Sri Lanka, these efforts have been extremely controversial in Thailand. Women attempting to ordain have been accused of attempting to impersonate monks (a civil offense in Thailand), and their actions have been denounced by many members of the ecclesiastic hierarchy. Most objections to the reintroduction of a female monastic role hinge on the fact that the monastic rules require that both five ordained monks and five ordained nuns be present for any new bhikkhuni ordination. Without such a quorum, critics say that it is not possible to ordain any new Theravada bhikkhuni. The Thai hierarchy refuses to recognize ordinations in the Taiwanese tradition (the only currently existing bhikkhuni ordination linneage) as valid Theravada ordinations, citing differences in philosophical teachings, and (more critically) monastic discipline.